Dr Ben Marsh grew up in Oxfordshire, completed his undergraduate and postgraduate degrees at the University of Cambridge (Downing College), and subsequently taught at Brunel University (2001-2), the University of Oxford, where he was a Lecturer in Colonial & Revolutionary American History (2002-4), and the University of Stirling in Scotland (2004-14). He joined the School of History at Kent in September 2014. 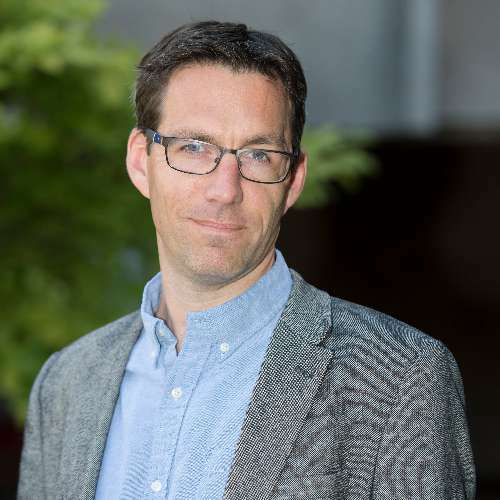 Between 2016-2018, Ben was the Director of Public Engagement for the Faculty of Humanities, a role intended to foster connections and collaborations between academics, their research, and wider audiences and communities beyond academia. He has featured on BBC Radio (latterly Witness, on Salem witchcraft and The History Hour, on the Donner Party), given talks and workshops to schools and history societies, and is working towards projects with museums and schools on the Age of Revolutions and the People's History of Kent. Within the University, Ben is an affiliate of the Centre for American Studies and the Centre for Heritage; he is also involved in work with colleagues in the Centre for the History of Colonialisms, Animal Studies, and the Centre for Medieval and Early Modern Studies. Ben's main research interests are in the social and economic history of the Atlantic world c.1500-1820 and the settlement of early America, including gender and race history, the US South and slave societies, demography, the American Revolution, and, latterly, textile history. His first book, Georgia's Frontier Women, explained how women's lives and experiences were central to the history and evolution of the colony of Georgia between the 1730s and 1790s. He is currently nearing completion of a longstanding research project on attempts to cultivate silk in the Atlantic world, which explores the intersections between political economy, utopianism, textile and commodity history, migration, and colonialism – entitled Silk and the Atlantic World, c.1500-1840. Supported by an AHRC Research Fellowship in 2013 as well as smaller grants from the Pasold Textile Research Fund, the Carnegie Trust, the Library Company of Philadelphia, and the Royal Society of Edinburgh, the project addresses why, how, and with what success different regions of the Americas took on the challenge of sericulture. Aspects of the research were recently recognised with the award of the Natalie Rothstein Prize by the Textile Society (2014), and Ben was featured as a consultant and guest on the 2013 BBC Radio 4 series Silk, presented by Steph McGovern. Ben's work on the topic featured in the international Enlightened Princesses exhibition at the Yale Center for British Art and Kensington Palace in 2017.
an exploration of the travails and rehabilitations of American loyalists during the Age of Revolutions. Ben has just completed co-editing a volume with Mike Rapport (University of Glasgow) on Understanding and Teaching the Age of Revolutions, which is part of the Harvey Goldberg Series and forthcoming with the University of Wisconsin Press. Ben teaches on the Atlantic world, the American Revolution, and the rise of the United States. Ben would be happy to field any questions or explore any potential postgraduate research topics that relate to his areas of expertise. He currently has research students working on topics including loyalism in revolutionary Georgia, political identity in the Mississippi Territory, and textile exchange between whites and Indians in the Lower South. Beyond the University, Ben is a Fellow of the Royal Historical Society, a committee member of the Historical Association (Canterbury), a member of the Canterbury Heritage Forum and sits on the Educational Committee of Waterloo200. He is leading a student ambassador scheme as part of Waterloo200’s educational legacy that brings exposure to schools, museums, and heritage partners with interests in the Age of Revolutions, c1775-1848. Marsh, B. (2014). ‘One Man Might Bring it to Perfection’: Rev. Ezra Stiles and the Quest for New England Silk. TEXT: The Journal of the Textile Society 41:4-13. Marsh, B. (2012). The Republic's New Clothes: Making Silk in the Antebellum United States. Agricultural History [Online] 86:206-234. Available at: http://www.dx.doi.org/10.3098/ah.2012.86.4.206. Between the American Revolution and the 1840s, silk cultivation was pursued enthusiastically across the United States. Although scorned at first, silk's republican virtues were rediscovered and rearticulated in the antebellum era by a range of proponents. Owing to an evolving infrastructure that integrated the press, the post, and agricultural societies, the appeal of silk drew in farmers and manufacturers of all classes and across many regions. Their disparate circumstances and motivations made a peculiar interest group, but one that secured considerable political and promotional support. More than just an exercise on paper, American silk was widely produced, thanks especially to the labor of women. Eventually, the far-flung community of sericulturists fell prey to environmental and labor-related limitations. But the speed of their downfall, linked to a speculative bubble in mulberry trees, was also due to the distinctive features of their agricultural reformism and its creative relationship with credibility. Marsh, B. (2012). Silk Hopes in Colonial South Carolina. The Journal of Southern History 78:807-854. The article discusses attempts to produce silk in colonial South Carolina, highlighting the economic, social, and political impacts of the state's colonial sericulture. The author highlights methods for producing silk, including discussions of public incentives and private investment, and describes the social impact of silk farming in terms of gender relations and British imperialism. The significance of the amount of silk produced in South Carolina is discussed, and the author notes the impact of silk farming in terms of labor, slavery, and plantations. Marsh, B. (2012). The Meanings of Georgia's Eighteenth-Century Great Seals. Georgia Historical Quarterly 96:195-232. Marsh, B. (2007). Facing West, South, and North, as Well As East, from Indian Country. Reviews in American History [Online] 35:176-183. Available at: http://www.dx.doi.org/10.1353/rah.2007.0035. Marsh, B. (2007). Planting families: Intent and outcome in the development of colonial Georgia. The History of the Family [Online] 12:104-115. Available at: http://www.dx.doi.org/10.1016/j.hisfam.2007.08.003. This article examines the evolution of a plantation society in the British American colony of Georgia. It explores the original intentions of founders and settlers, and how those intentions were discarded or adapted in the face of a volatile demographic environment. It uses information from land grant applications to describe the make-up of late colonial families, and locates the experiences of the Georgia population within the broader context of Atlantic population history. In particular, it argues that familial instability initially catalysed the emergence of a plantation system. The “family” was later accorded real significance in plantation Georgia only when it became serviceable to provincial elites, though it remained important as an organising unit beyond the plantation world, and as a source of shared aspirations. Marsh, B. (2004). Women and the American Revolution in Georgia. The Georgia Historical Quarterly [Online] 88:157-178. Available at: http://www.jstor.org/stable/40584736. Marsh, B. (2012). Georgia's frontier women: Female fortunes in a southern colony. Athens, Georgia: University of Georgia Press. Marsh, B. (2018). 'The Honour of the Thing': Silk Culture in Eighteenth-Century Pennsylvania. in: Schafer, D., Riello, G. and Mola, L. eds. Threads of Global Desire: Silk in the Pre-Modern World. Oxford: Boydell and Brewer. Available at: https://boydellandbrewer.com/threads-of-global-desire-hb.html. Marsh, B. (2017). The World Wide Web: Using the Internet to Teach Revolutions. in: Understanding and Teaching the Age of Revolutions. Wisconsin, US: University of Wisconsin Press, pp. 1-18. Available at: https://doi.org/10.3368/bk.313043.chwww. Marsh, B. (2017). Visitor from South Carolina: Mrs Eliza Pinckney. in: Marschner, J. ed. Enlightened Princesses: Caroline, Augusta, Charlotte, and the Shaping of the Modern World. Yale University Press. Available at: http://yalebooks.yale.edu/book/9780300217100/enlightened-princesses. Essay on the subject of textiles, gender, race, and imperialism, based on an encounter recorded in a letter by the South Carolina plantation mistress Eliza Pinckney about her visit to Princess Augusta, commissioned as part of the Enlightened Princesses book and exhibition (Yale Center for British Art & Historical Royal Palaces). Marsh, B. (2015). "Improvement", "Dr. John Lining", and "Henry Ellis". in: Spencer, M. G. ed. The Bloomsbury Encyclopedia of the American Enlightenment. New York, USA: Bloomsbury Academic. Marsh, B. (2012). Borderlands. in: The Oxford Encyclopedia of American Social History. New York, USA: Oxford University Press, pp. 117-120. Available at: http://www.oxfordreference.com/view/10.1093/acref/9780199743360.001.0001/acref-9780199743360-e-0058?rskey=UvMVIg&result=62. Marsh, B. (2009). Elizabeth Lichtenstein Johnston (1764-1848):" Shot Round the World but Not Heard". in: Chirhart, A. S. and Wood, B. eds. Georgia Women: Their Lives and Times. Athens, Georgia: The University of Georgia Press, pp. 58-81. Marsh, B. (2007). ‘The Very Sinews of a New Colony’: Demographic Determinism and the History of Early Georgia Women, 1732-1752. in: Gender, Race and Religion in the Colonization of the Americas. Aldershot: Ashgate, pp. 39-53. Available at: http://www.ashgate.com/isbn/9780754651895. Marsh, B. (2006). “Associates of Dr. Thomas Bray,” “Georgia Trustees,” “Keith, George,” and “Whitefield, George”. in: Hinks, P. P. and McKivgan, J. eds. Encyclopedia of Antislavery, Abolition, and Emancipation. Westport: Greenwood Press, pp. Vol.1: 68-9, 297. Marsh, B. and Rapport, M. eds. (2017). Understanding and Teaching the Age of Revolutions. [Online]. University of Wisconsin Press. Available at: https://uwpress.wisc.edu/books/5416.htm. Marsh, B. (2018). Colonial Couture: Luxurious Tipping Points in Early Massachusetts [Essay]. Available at: https://earlyamericanists.com/2018/09/20/luxurious-tipping-points-in-early-massachusetts/. Marsh, B. (2017). Colonial Coutures: Making American Pompons Great Again [Essay]. Available at: https://earlyamericanists.com/2017/02/13/roundtable-making-american-pompons-great-again/. Marsh, B. (2013). Silk [Online Bibliography]. Available at: http://www.dx.doi.org/10.1093/obo/9780199730414-0233. Marsh, B. (2006). Colonial Immigration [Website]. Available at: http://www.georgiaencyclopedia.org/articles/history-archaeology/colonial-immigration. Immigrants to colonial Georgia came from a vast array of regions around the Atlantic basin—including the British Isles, northern Europe, the Mediterranean, Africa, the Caribbean, and a host of American colonies. They arrived in very different social and economic circumstances, bringing preconceptions and cultural practices from their homelands. Each wave of migrants changed the character of the colony—its size, composition, and economy—and brought new opportunities and new challenges to the people already there. A majority of the immigrant white population traveled to Georgia because of the availability and cheapness of land, which was bought, bartered, or bullied from surrounding Indians: more than 1 million acres in the 1730s, almost 3.5 million acres in 1763, and a further cession of more than 2 million acres in 1773. Marsh, B. (2018). Beyond the Barricade: Is There A World You Long to See? Beyond the Barricade:9-12. Marsh, B. (2017). Age of Revolution: Theme Summaries & Key Messages. [Essay]. Available at: https://ageofrevolution.org/. This provides an overview of the major historical developments warranting coverage within each subtheme for the Age of Revolution Waterloo200 Legacy project, though some areas will be more fertile (and therefore receive more coverage) than others, as discussed at the October 2017 meeting of the Education Committee. The intention is to provide a precis and some concise context for key features, and to demonstrate linkages within and across themes. The overviews are concluded by a set of bullet points indicating “Key Messages” to push in each sub-theme, usually in response to our over-arching questions: what transformations were occurring, where were they most visible, and who did they impact upon? Marsh, B. (2017). Colonial America and the Earl of Halifax, 1748-1761. History:722-723. Marsh, B. (2017). Slavery and Freedom in Savannah. Slavery and Abolition [Online] 38:213-215. Available at: https://www.tandfonline.com/doi/full/10.1080/0144039X.2016.1242901. Marsh, B. (2014). On the Rim of the Caribbean: Colonial Georgia and the British Atlantic World, by Paul M. Pressly. Florida Historical Quarterly:110-112. Marsh, B. (2014). The Acadian Diaspora: An Eighteenth-Century History, by Christopher Hodson. English Historical Review [Online] 129:461-462. Available at: http://www.dx.doi.org/10.1093/ehr/ceu035. Marsh, B. (2011). Abigail Adams, by Woody Holton. Journal of Southern History 77:409-410. Marsh, B. (2010). Atlantic Families: Lives and Letters in the Later Eighteenth Century by Sarah M. Pearsall. Gender and History [Online] 22:500-502. Available at: http://dx.doi.org/10.1111/j.1468-0424.2010.01602_26.x. Marsh, B. (2010). The Colonial American Origins of Modern Democratic Thought, by J.S. Maloy. English Historical Review [Online]:140-142. Available at: http://www.dx.doi.org/10.1093/ehr/ceq140. Marsh, B. (2010). Corra Harris and the Divided Mind of the New South by Catherine Oglesby The Weight of Their Votes: Southern Women and Political Leverage in the 1920s by Lorraine Gates Schuyler. Gender & History [Online] 22:505-507. Available at: http://doi.org/10.1111/j.1468-0424.2010.01602_30.x. Marsh, B. (2009). In Search of Ulster-Scots Land: The Birth and Geotheological Imagings of a Transatlantic People, 1603--1703. By Barry Aron Vann. Journal of American History 95:1132-1133. Marsh, B. (2008). Captive Histories: English, French and Native Narratives of the 1704 Deerfield Raid, by Evan Haefeli and Kevin Sweeney. French History [Online] 22:116-117. Available at: http://dx.doi.org/10.1093/fh/crn004. Marsh, B. (2008). Masterless Mistresses: The New Orleans Ursulines and the Development of a New World Society, 1727-1834, by Emily Clark. American Historical Review [Online] 113:171-172. Available at: http://doi.org/10.1086/ahr.113.1.171. Marsh, B. (2007). By Birth or Consent: Children, Law and the Anglo-American Revolution in Authority by Holly Brewer. English Historical Review [Online] 122:753-755. Available at: http://www.jstor.org/stable/4493913. Marsh, B. (2005). Chains of love: Slave couples in Antebellum South Carolina, by Emily West. Journal of Peasant Studies [Online] 32:313-419. Available at: http://www.dx.doi.org/10.1080/03066150500094550. Marsh, B. (2018). Unravelled Dreams: Silk and the Atlantic World, c.1500-1840. Cambridge University Press. Unravelled Dreams addresses the history of the pursuit of sericulture (silk production) in the Atlantic world, attempted by Spanish, French, British, and American empires and populations between the sixteenth and nineteenth centuries. It shows that in spite of repeated failures, silkworms were at the cutting edge of Atlantic imperialism. By taking the commercial failure of silk seriously, historicising it, and examining the numerous experiments (large and small) across New Spain, New France, many small corners of northern Europe, and especially British North America and the early United States, we can locate new insights into the determinative matrix of aspiration, labour, environment, and economy in these societies. Each devised its own dreams and plans of cultivation, framed by the compound particularities of cultures and landscapes. Writ large, these dreams would unravel one by one: the attempts to introduce silkworms to new regions around the Atlantic world – powered by Europeans’ consuming appetite for their fibre – ultimately constituted a step too far, marking out the limits of Europeans’ seemingly unbounded power. That they were bewildered by this failure, and for over three hundred years sought to counter environmental and demographic odds stacked against them, turning from one site to another, and mobilising every theory and workforce that they could muster, was a profoundly energising force. It opened up creative models of colonialism, exchange, domestic production and regional interconnection – some of which would disappear altogether, some fall into myths that would be recycled, and others which would become spurs to more commercially successful projects as people, policies, and ideas were recycled from silk to other more competitive and achievable products.